James E. Hansen (born March 29, 1941 in Denison, Iowa) headed the NASA Goddard Institute for Space Studies in New York City, a part of the Goddard Space Flight Center in Greenbelt, Maryland, Earth Sciences Division until early 2013. He is currently an Adjunct Professor in the Department of Earth and Environmental Sciences at Columbia University. 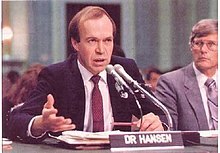 Hansen is best known for his research in the field of climatology, his testimony on climate change to congressional committees in the 1980s that helped raise broad awareness of the global warming issue, and his continuing advocacy of action to limit the impacts of climate change. He has been a critic of the Bill Clinton and George W. Bush Administration's stances on climate change. Hansen studied astronomy and physics in the 1960s at the University of Iowa. He did scientific research on the atmospheres of other planets, and later Earth's atmosphere. Hansen was elected to the National Academy of Sciences in 1996 and he received a US$250,000 Heinz Environment Award for his research on global warming in 2001. He was listed as one of Time Magazine's 100 Most Influential People in the Time 100 (2006) list and, in 2007, he shared the US$1 million Dan David Prize. On April 5, 2008, Dr. Hansen received the PNC Bank Common Wealth Award of Distinguished Service for his outstanding achievements in science. Hansen posited in a 2007 paper that 350 ppm (parts per million) of carbon dioxide in the atmosphere is a safe  upper limit to avoid a climate tipping point. The current record level is 389 ppm of CO2, an almost 40-percent increase from the pre-industrial revolution level of 278 ppm. In 1988 the Earth's atmosphere surpassed the 350 ppm mark, while global CO2 emissions per capita rose. ↑ "Goddard Institute for Space Studies". NASA. ↑ "Goddard Space Flight Center". ↑ "Rewriting The Science". www.cbsnews.com. ↑ "Directory of the National Academy of Sciences". Retrieved 2007-06-19. ↑ "The Heinz Awards". Heinz Awards. Retrieved 2008-09-27. ↑ "South Lincoln County News". www.southlincolncountynews.com. Retrieved 2009-10-22. ↑ "Envoy Says U.S. Won't Pay China to Cut Emissions - WSJ.com". online.wsj.com. Retrieved 2009-12-10. ↑ Torello, Alessandro (14 December 2009). "U.N. Sets High Bar On Emissions Cuts" – via www.wsj.com. ↑ Nocera, Joe (4 March 2013). "Opinion - A Scientist's Misguided Crusade" – via NYTimes.com. ↑ By. "Top climate change scientists issue open letter to policy influencers". CNN.